In so many cases, the fall sets up the early ice bite. At the very least, what happens as the lake freezes sets the course for the beginning of winter. There are variables each winter that influence the location of where we find walleyes at early ice. Some of the outcomes of some of these variables can be predicted ahead while other outcomes are figured out after the fact. If there is a lesson I have learned over and over, that lesson would be that we cannot predict ever outcome ahead. Just like there are upsets in World Series and Super Bowls that prove pundits wrong, there are situations in fishing that are difficult to always prove correctly. At the end of the day, we still have to keep an open mind and fish through locations and patterns with a process of elimination strategy. With that disclaimer, there are still some guidelines that serve us well when trying to figure out walleye at first ice. If there is a lesson that has been a hard lesson at times, that lesson would be simply not looking shallow enough at early ice. Can’t tell you how many times we found aggressive fish in less than six feet of water. Shallow is a relative term but in my mind, shallow is anything less than ten feet. There is an art however to really dialing in shallow bites. If there is one mistake many anglers make, it is underestimating the impact our presence has on shallow fish. We wouldn’t expect to catch fish in four feet of water after driving a boat over the spot during the spring yet many anglers make the mistake in the winter of simply having too much commotion over the spot when ice fishing. You can get away with much more commotion when you get thicker ice and snow cover but plan on fishing being spooky at early ice when you are dealing with little ice or in some cases, no snow cover. Don’t drive your quad right over your fishing spot. Keep your walking to a minimum. Over the years, I have come to the realization that I usually catch more fish if I simply plant down on a good spot and drill the bare minimum of holes and sit still. In most cases, there are not a lot of people out right away. Pressure is light and that is an advantage. You can sit on key spots and work the natural flow of fish that wander underneath you. Drill your holes and let everything settle down and wait for the sun to get low, that is the basic program on most water. At first ice, we often find walleye relating to shoreline related structure. Either tall standing weed lines or some type of rock or gravel bottom. I say tall standing because I have learned over the years that weeds don’t have to be green to hold fish at early ice. If there is good water circulation and oxygen which usually isn’t an issue at early ice, there are often fish holding off cabbage for example which is often brown by late fall. If the weeds are brown, that is fine as long as they are still not down. Brown is fine, brown and down is not so ideal. Other weeds like coontail, milfoil also hold fish. Tall stands next to a subtle dip are often prime spots but don’t overlook the corners and pinch points on large shallow flats. These fish often travel like mobs and all you have to do is intersect a few of these mobs during each outing. The peak activity often occurs at sunset or shortly after dark on many fisheries but water that is really turbid can see a daytime bite in shallow water. Jason Mitchell highlights some proven game plans and lessons for targeting walleye at early ice. 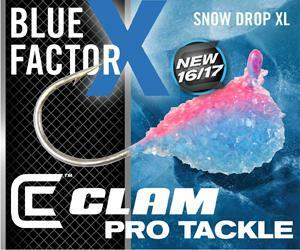 Safety items like Clams new Rise Float Suit give ice anglers peace of mind. Strong winds late in the fall during the freeze up period especially can have a drastic effect on early ice walleye fishing. Strong winds can really mess with water clarity and set the tone for early ice walleye. This wind affect can really become evident on large bodies of water like Lake of the Woods and Devils Lake. A tell-tale sign at early ice is a lot of broken up ice that is rough and jagged. This turbulence not only seems to effect water clarity and visibility but also seems to move fish around during the process. As the sediment settles, the bite often gradually improves. As a general rule of thumb, the chaos of this type of freeze up often seems to push fish deeper and bad visibility combined with deep fish is often a tough combination. On Lake of the Woods, we have combated this situation by focusing on river fish that moved up to follow the shiner run that occurs in the fall. Instead of going out on the lake past the island for example, we fished further in hoping to intersect fish that were moving from the river out into the lake. Ice safety is always a factor at early ice and river ice takes much longer than lake ice but the advantage of rivers is that they do clean up much faster than large lakes. Always easy to over analyze situations but at early ice, the first people to fish many locations often score big. The key to success is really to be safe and diligent by simply being in the know. If you are the first person to walk out on five inches of ice with a spud bar and diligently pick your way to a good spot, you are typically going to experience the best fishing. After word travels and people realize that there is good enough ice, the spot will cool off when more people arrive. When more ice develops and you can take a quad safely out on the ice to reach new spots that are further than walking distance, the first people in the know score. The people who figure out after the fact get the scraps. Being in the know takes some diligence. Don’t over think location. There are great spots that are no secret and if you are the first lure on that spot after a month of no angling pressure, you are usually going to encounter fish that make you look good. Don’t compromise safety to get on ice but always think like a hunter. Fishing fresh ice is important all through the winter but seems especially critical at early ice because a little bit of clear ice and shallow water in particular combine to create short opportunities. On average, we might only get two days off a spot where the fishing could be considered good. Doesn’t take long to wear out your welcome. As mentioned above, the best locations and patterns at early ice are simply a continuation of the fall. Lakes that were fishing poorly in the fall often have a tough bite at early ice. I often head to locations at early ice where we caught fish a month prior. On Devils Lake for example where I live, if a flooded road bed was hot in October and November, that is where I will start at early ice. Usually, finding fish at early ice is that simple. If a spot was quiet in the fall, very seldom do I find much has changed three weeks later once the lake gets ice. Obviously, people who put in time on the water during the fall have a great advantage at early ice. If you don’t get to spend a lot of time on the water during October and November, you can still follow fishing reports and general activity to narrow your focus. If a particular lake is simply fishing well during the fall and getting some attention, that is a great starting point for example. If the fish are not on shallow weeds on a particular lake during the fall like they are some past years, that is still relevant information for early ice. Particularly when you have to walk out and drag your gear on the ice, the more shortcuts you can take the better. You have to be strategic and pick your spots because if the spot doesn’t pan out, it is not always easy just to pack up and walk to another spot. There is no broad stroke approach when you are on foot. Early ice is one of my most coveted windows for finding and catching walleye through the ice. 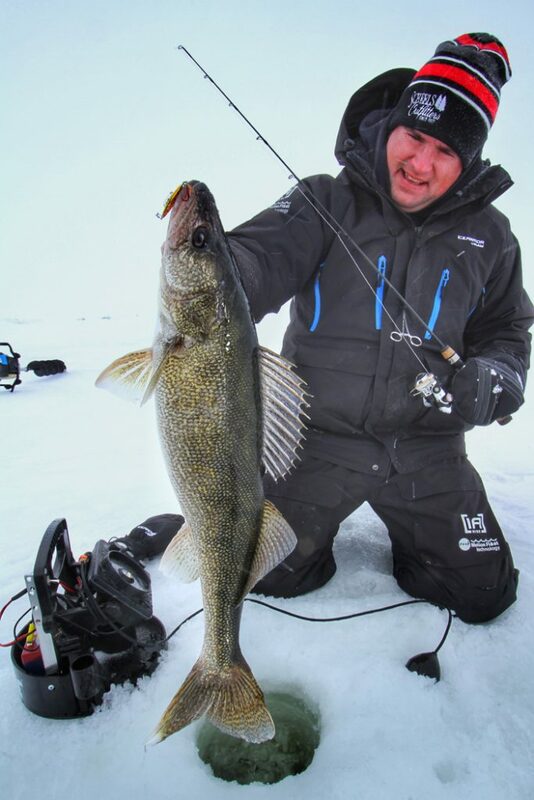 Especially in states where the walleye season closes during the late ice period, the early ice time is perhaps one of the best periods to find some of the most incredible fishing. Prioritize safety over catching fish but make a point to experience this opportunity if you are physically able. 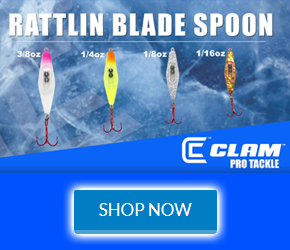 Always test the ice with a spud bar and have the proper tools like ice picks and a floatation suit like Clams popular Ascent Float Suit or the new Rise Float Suit. Carry a throw rope in your sled or Fish Trap and use common sense. The reward is some of the best walleye fishing of the winter. The Author, Jason Mitchell hosts the popular outdoor program Jason Mitchell Outdoors which airs on Fox Sports North on Sunday mornings at 9:00 am. More information can be found online at www.jasonmitchelloutdoors.com. Follow on YouTube, Facebook and Instagram.